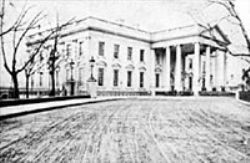 The new elegance of the White House was undermined by heavy traffic from citizens interested in visiting the Lincolns or just taking home a piece of their house. The Civil War brought thousands of Americans to Washington on military other official business. French reporter Ernest Duvergier de Hauranne wrote that “At all hours of the day, you will find curious or idle people milling about in the great reception room where the President holds his popular audiences. It is said that some visitors – country bumpkins, no doubt – cut pieces from the silk curtains to take home as souvenirs of their pilgrimage. You may think that a policeman or at least a guard has been posted. Not at all! There is only a notice asking visitors to respect the furnishings, which belong to the government.”1 Wear and tear was clearly exacerbated by this lack of security at the White House. Indeed, the depredations to the Executive Mansion worsened after the President’s death in April 1865 when servants and visitors both took advantage of lax security to remove everything from crystal to furnishings. According to White House historian William Seale, “With no supervision, tourists who were so inclined looted the state rooms for souvenirs. Stackpole the steward either could not keep order, or did not have the good judgment to do so. The public pressed in when the doors opened in the morning and left only when forced out by the afternoon closing.” Later, a grieving Mary Todd Lincoln was blamed for the disappearance of government property and committing the depredations of many souvenir-seekers. Harold Holzer, editor, Lincoln As I Knew Him, p. 116. Michael Burlingame, editor, Lincoln Observed: Civil War Dispatches of Noah Brooks, p. 148. Margaret Leech, Reveille in Washington, p. 357-358. Margarita Spalding Gerry, editor, Through Five Administrations: Reminiscences of Colonel William H. Crook, p. 26. Michael Burlingame, editor, Inside the White House in War Times, p. 183 (From William O. Stoddard, Sketch #9).